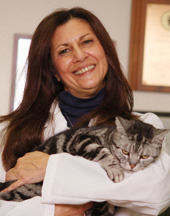 Ms. Castellano is the office manager at the Animal Endocrine Clinic (AEC) in Bedford Hills, NY. For over a decade, she has been handling all of the scheduling, client relations and administrative duties at the Westchester clinic. Her previous experience volunteering at an animal shelter helped her to seamlessly move to AEC's inviting and animal-filled environment. Prior to working at the Animal Endocrine Clinic, Ms. Castellano had a mixed professional career that included working in both office management and public relations/marketing. She spent a short time at an insurance company honing her administrative and office management skills, but spent the majority of her career working in marketing and public relations for Pepsi-Cola Company. Her family has four cats, Sweetie, Stripes, Molly and PeeWee.